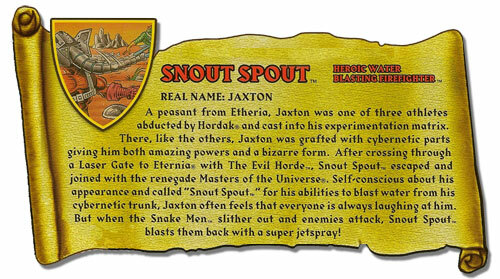 A peasant from Etheria, Jaxton was one of three athletes abducted by Hordak® and cast into his experimentation matrix. There, like the others, Jaxton was grafted with cybernetic parts giving him both amazing powers and a bizarre form. After crossing through a Laser Gate to Eternia® with The Evil Horde™, Snout Spout™ escaped and joined with the renegade Masters of the Universe®. Self-conscious about his appearance and called “Snout Spout™” for his abilities to blast water from his cybernetic trunk, Jaxton often feels that everyone is always laughing at him. But when the Snake Men™ slither out and enemies attack, Snout Spout™ blasts them back with a super jetspray! Because he joined the MOTU toyline after the Filmation cartoon had ended, Snout Spout was incorporated into the She-Ra cartoon, which is presumably why he has an Etherian origin here. But even the cartoon version was confusing; of the three episodes he appeared in, sometimes he was depicted as an Etheria resident (and was even referred to by his original concept name of “Hose Nose”) while other times he was Prince Adam’s friend from Eternia. Finally, issue #26 of the United Kingdom MOTU comic featured the story “The Unknown Warrior” in which Snout Spout was an Etherian peasant who was experimented on by Hordak and transformed into an elephant-headed freak who later escaped to Eternia and joined the Heroic Warriors. This bio synthesizes elements from all these origins, but adds the interesting wrinkle that Snout Spout evidently served as a Horde member for at least a little while. It raises the question as to whether “Jaxton,” like so many other Horde members, wasn’t simply brainwashed. Maybe they hadn’t worked out the kinks yet? Did Jaxton do any evil deeds as a Horde member? Did he kill a fat barkeep? I love the lack of resolution to his bio, too: “Jaxton often feels that everyone is always laughing at him.” Oh, and he fights the Snake Men. So we’re left to think either people are laughing at him or he’ll continue to suffer crippling paranoia that they are. As for that last bit, why the Snake Men, you ask, rather than Hordak or Skeletor, either of whom would make more sense? Because the last sentence has to come from the card back, people! I admire Toyguru's dedication to using the original packaging bio, but in cases like this I wouldn't mind if he did without it or just incorporated it into a new bio that was more fluidly written. I just find it a bit amusing that a story point on a 2012 bio is dictated solely by the fact that the original Snout Spout happened to be released at a time when Mattel was hyping the Snake Men as He-Man's major new foes. "The Snake Men slither out and attack, but Snout Spout blasts 'em back with a super jetspray!" Look at all the liberties that were taken! Adding in "and enemies" makes it unclear whether he's helping the Snake Men against their enemies, or fighting them. Or maybe he's an exhibitionist who can only fight enemies when the Snake Men are watching. And don't get me started on switching from "'em"to "them." Completely destroys the nostalgia. well said sir. that brought a tear to my eye i was laughing so hard. they might saved a lot of people a lot of money if they'd included the line "he'll blast back one or two snake men, and then he'll stop because his trunk will have severe tearing!" Oh, low blow! But nice.